Hands on Training provide a wide range of first aid courses to individuals and companies based in the Reading area including the First Aid at Work 3 day course and the Emergency First Aid at Work 1 day course. This three-day course is approved by the Health and Safety Executive under the Health and Safety Regulations for successful candidates to act as first-aiders in their workplace and is valid from 1 October 2009 under the revised first aid training regulations. This course provides the comprehensive set of practical skills needed to become a confident first aider at work, giving you both the ability and knowledge to deal with first aid emergencies. This course is valid from 1 October 2009 to meet the revised standards for first aid training. Students are independently examined on the final afternoon of the course. After completing a final assessment successful candidates receive an HSE approved certificate valid for three years. 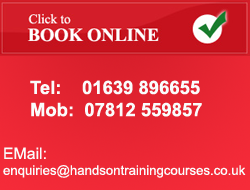 This course is legally compliant with the current Health and Safety (first aid) Regulations 1981. Upon successful completion of this three day course, first aiders receive certification to allow them to practice for three years after which a re-qualification course becomes necessary. It is strongly recommended that you update your skills by taking an annual refresher. Duration: 3 consecutive days or 3 days spread over a number of weeks. So if you are looking for a cheap first aid at work training course to keep your training costs to a minimum contact us to confirm prices and dates. Hands on Training can provide training across all of the Reading area including Bracknell, Slough, High Wycombe, Newbury and Basingstoke. Venues are arranged to suit the needs of the training. If you would like further information for any of our courses you can telephone 078125 59857 or 01639 896655; or alternatively you can use our contact form with your enquiries.